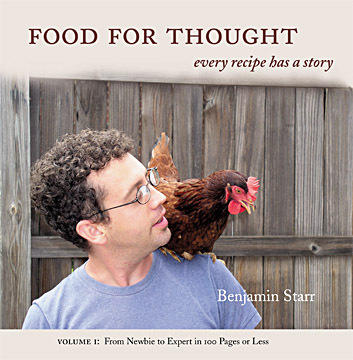 My Cookbooks | Have YOU Ben Starr Struck? Lots of fans ask me, “Will you publish a cookbook someday?” And the answer is…I already have! Click on the image below to order it! The Wandering Foodie: This second volume will contain recipes from the fascinating people I’ve met in my travels across all seven continents. You’ll see photos from some amazing and exotic places, and you’ll learn how to make all those things you’ve heard of and love, but wouldn’t have a clue how to make, like creamy hummus, babaganouj, tamales, or caipirinhas. Expand your world and bring global cuisine to your dinner table! Your Daily Bread: Bread baking is my specialty, and this isn’t your average bread book. It contains tips and tricks for getting professional-style loaves in your home oven, as well as information on how to build your very own wood-fired bread oven in your backyard for less than $100. America has forgotten how to bake the delicious, hearty loves that our ancestors enjoyed a century ago. And I’m bringing it all back for you! Pumpkin a’Plenty: You know exactly how much I love pumpkins, and this will be the KING of all pumpkin cookbooks. From stuffed pumpkin blossoms to pumpkin seed brittle to my legendary pumpkin carrot cake, this cookbook brings every part of the pumpkin plant to all 3 meals. Also included are full menus and recipes from my annual Fall Dinner Party that draws people from around the world. Cookbook self-publishing is an expensive and time consuming endeavor. I hope to have another volume out in time for the holiday season in 2012. I was watching Masterchef and solo sad that you got out before the final four… I wanted so much to see more pumpkin magic! Well, I’m going trough the comments and I see there are a lot of people from all over the world, so I decided to say hello from Portugal. I don’t know if you are a good cook because I’ve never tasted one of your dishes (of course) but I love your personality 😉 God bless you for being so much efusive as you are! If you haven’t been to Portugal, you should definetely come here, try our “a thousand ways to cook codfish”, our bifana and also since you like baking you have to try our lemony custard tart called “pastel de nata”, it is heavenly.